I think we probably overlook tiles as a way of creating texture and interest when we decorate and see them simply as a practical solution in the bathroom or kitchen. But tile style has evolved hugely and there are now lots of ways to use tiles as the main effect in your room. 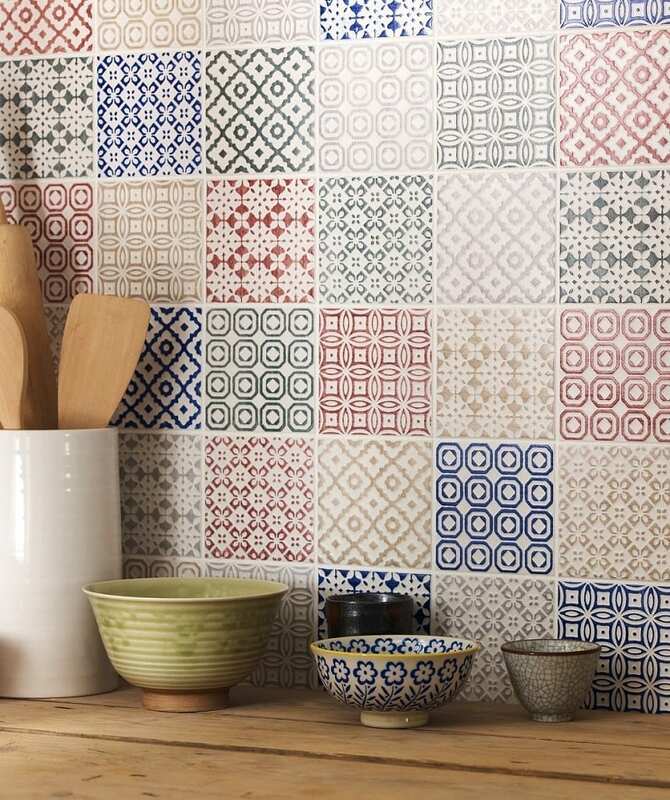 Gone are the days when you put up some neutral tiles and added a colourful border tile. There are now all kinds of finishes and effects that create wonderful features in many rooms. 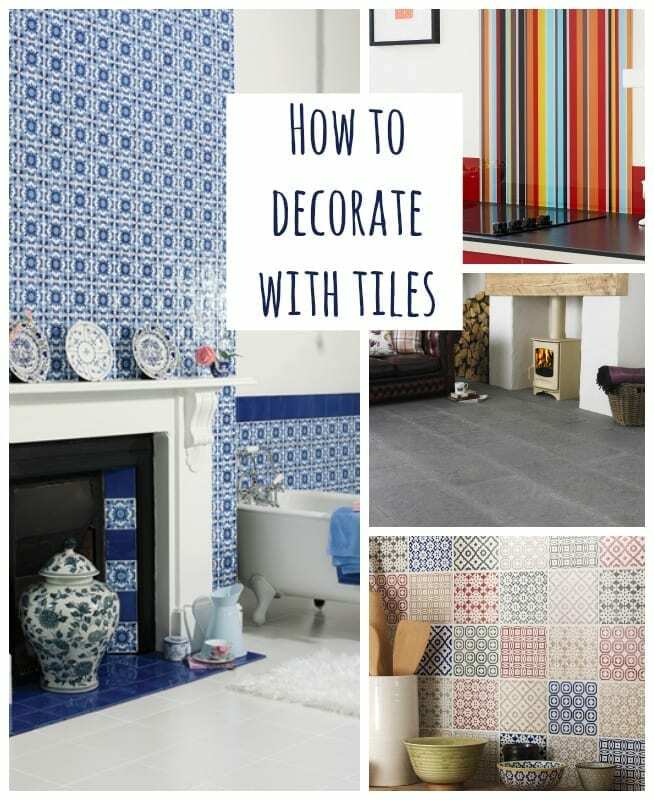 So with that in mind I thought I’d put together a few little ‘How to Decorate with Tiles’ tips. I know this look has been around for quite a while now, but I never tire of looking at it. With tiles available in beautiful colours and different sizes you can create something really wonderful in the brick wall style. 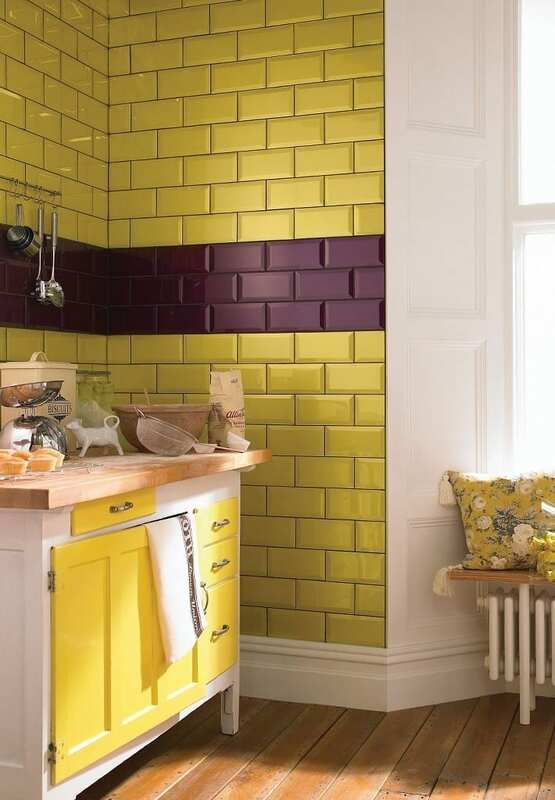 I love the clashing duo of yellow and aubergine, quite bold and gutsy but this would look just as effective in a simple with, possibly with coloured grouting. Oh I just love these ready made hob splashbacks that are now available. As in this image you can co-ordinate the look with your kitchen cabinets to really finish the look. If this bold stripe isn’t for you there are lots of more subtle patterns available to suit all kinds of taste. The Moroccan look is very popular now and even if you aren’t into Moroccan design, this patchwork effect looks pretty and would suit many different homes. Teamed with lots of rustic wood it looks natural and authentic, brighening up any kitchen. Of course, let’s not forget floor tiles. 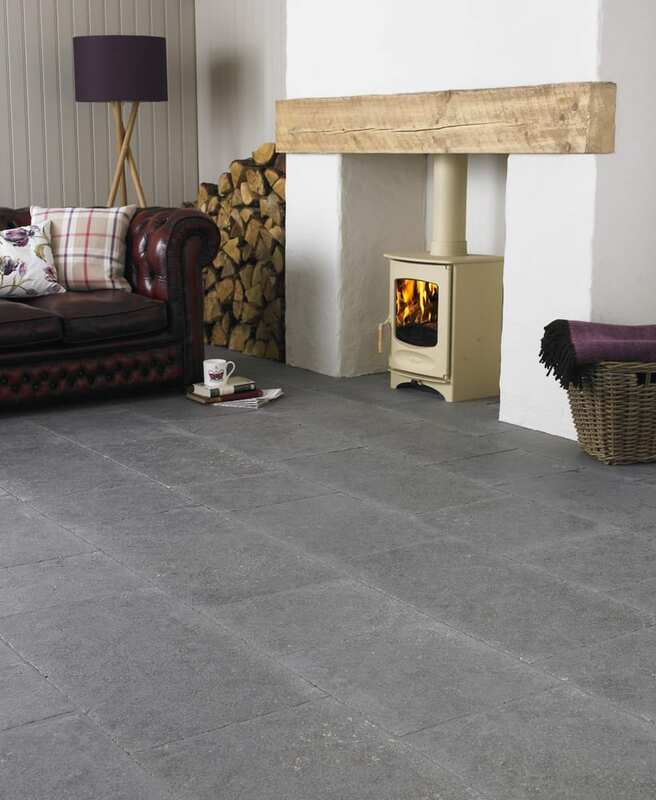 These beautiful Floor Tiles from Topps Tiles are made of Portugese Limestone and are extremely hardwearing and durable. With a unique hammered, aged effect they look like they’ve been around for years. They would suit any kind of rough luxe look with simple colours, rustic wood furniture and natural, organic interiors. 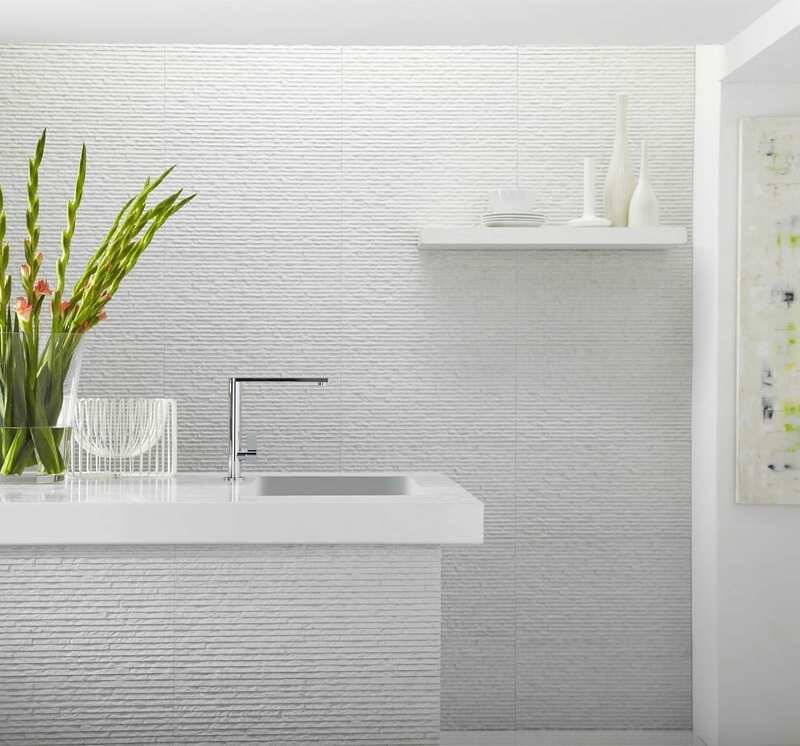 Have you ever thought of using tiles to create that feature wall in a room? Probably not. We’re used to using paint and wallpaper to gain this effect but there are lots of ways you can use tiles, if you choose the right sort, to get exactly the same kind of effect with a different finish. Look what an impact these gorgeous Moorish blue hues have on this simple white bathroom. Stunning. If colour isn’t for you, and all you crave is something simple and white, that doesn’t have to mean a flat, dull effect. These textured tiles will add warmth and depth to your bathroom, allowing the light to bounce around the room in a different way. Maintain the simplicity with all white accessories, or go for some neutrals or even brights to bring it to life. So, hopefully that’s useful for you if you’re considering purchasing some tiles in the near future. Have you used any tiles like these in your homes? 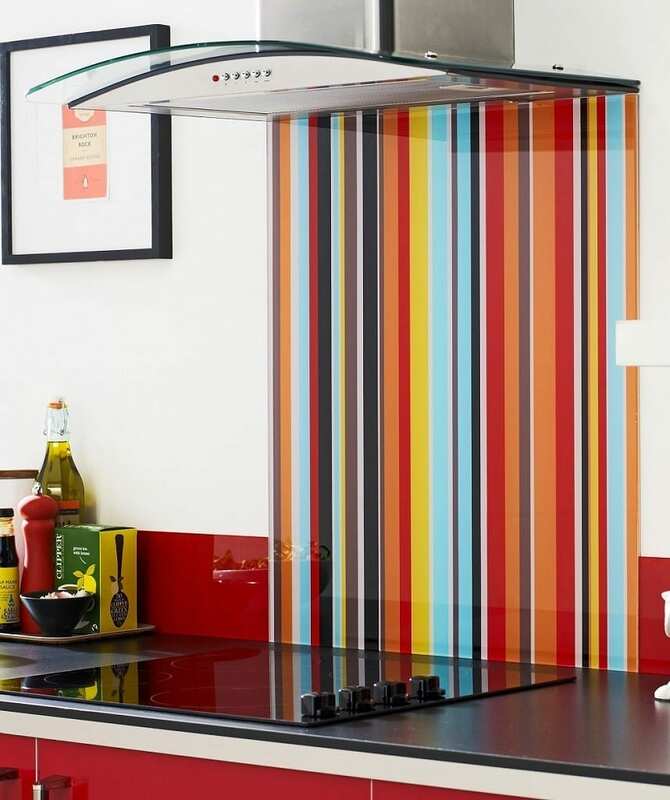 Can you tell me where to get the paul smith stripe style splash back please ? Hi Rich, they used to be available at Topps Tiles, not sure if they still are, but worth checking it out. hey Jen, Awesome Ideas to decorate home with this styles. Really if people have any ideas they can decorate using the tiles combinations and make a unique home . Keep blogging! Thanks!